The journey was long for Eric, Roberta and their young son and a new puppy. Of course, it would be a big lifestyle change from an apartment in Manhattan to a house in the suburbs. First of all, when you could routinely have any nationality of cuisine delivered to your doorstep within 20 minutes, anything less seemed quite inconvenient. Add to this the perspective of coming from a classic doorman building on the Upper West Side near parks and subways with magnificent pre-war details and 11-foot ceilings, and you were starting with high expectations… as you should! There was no pressure to move, but it was time for a new experience, a home to spread out in with a yard, an active town, and excellent public schools. Roberta was drawn to the open space and pastoral scenery in upper Westchester County, New York. Eric wanted a town with direct train service to Grand Central to make the commute to his Park Avenue office as painless as possible. 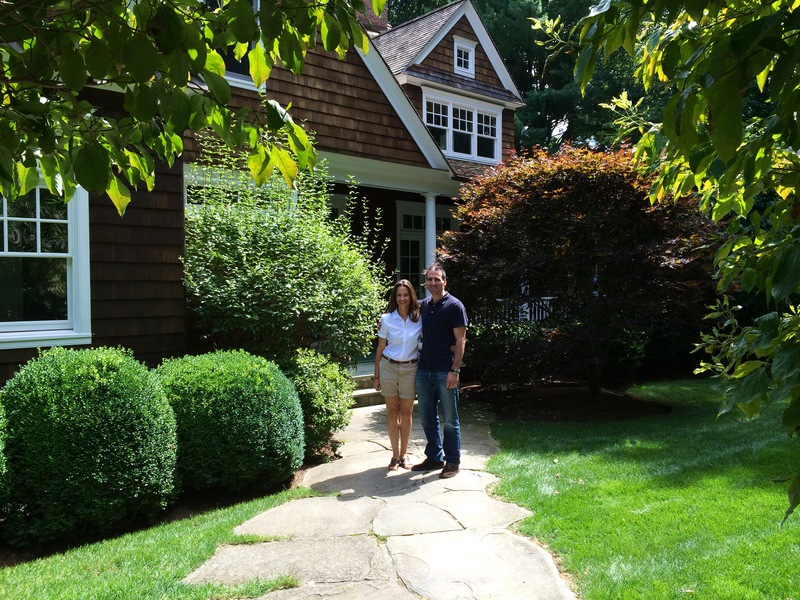 The family began their search in Westchester, but after evaluating the homes, amenities and property taxes there decided that Fairfield County Connecticut would be a better fit. So they set their focus on Westport and rented a summer house there to get to know the town. Their wish list included a neighborhood with a country feeling and a location on a quiet street, but not too far from the train. The home needed to be something special- an older house with charm and good bones, or maybe a new construction with timeless style. There needed to be at least an acre of property with bucolic surroundings. The ceilings had to be high, and the flow had to be practical as well as aesthetically pleasing. The architecture had to be true to its form and consistent throughout. High-quality details such as wide plank wood floors and large windows for ample natural light and pretty views were key. A front porch was a plus, and so was a pool. Last but not least, the chemistry had to be there. So we looked. And we looked. Over time, we found that the Greens Farms and Old Hill neighborhoods had the location and feeling that Eric and Roberta were looking for. We saw many, many homes that had many great features. But finding the perfect blend was not easy- as a typical suburban home would not do. See what Eric, as well as other clients, thought about the process. Finally, after two an a half years, the winning home was found! It was gorgeous. It was custom built and designed by talented architect, John Fifield. It had the special combination of flow, uniqueness, proportions, elegance and setting. It had a romantic wrap around porch and a pool. It had the chemistry! And that’s how the story begins. A family’s quest leads to their new castle in Old Hill. …a few months later, all is well! Categories: Fairfield County Housing Market, Gifts, Home, Home buying, Home selling, New Construction, Real Estate, Relocation, Testimonial, Thank you, Town Resources, Westport Housing Market | Tags: Architects, buyers, closing, Connecticut, fairfield county CT real estate, Fairfield County real estate, gifts, holidays, home buyers, home sellers, housing market, new home, Relocation, sand castle, sellers, testimonials, thank you, westport, Westport CT, William Raveis Real Estate, William Sonoma | Permalink. William Raveis Real Estate 2525 Post Road, Southport CT 06890 Licensed in CT Home is a most important place and a most significant asset. One's home is his castle. This is why I love to join my clients in the chapter of their lives when it’s time for their next one. It's a critical business transaction and a complex process, but most important, it's an emotional, exciting and monumental time! I am honored to share this time with my clients, buffer the anxiety, guide the course and share the joy! With top area market share, a global network in my pocket and the best cutting-edge resources available, I go above and beyond for my clients to get them where they want to go. Royal service when it's time for your next castle! This blog is updated periodically as indicated by post dates. Linda, They must love the suburbs but miss the City!